Definitions of surds: A root of a positive real quantity is called a surd if its value cannot be exactly determined. 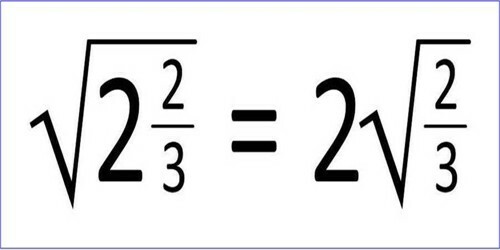 It is a number that can’t be simplified to remove a square root (or cube root etc). For example, each of the quantities √3, ∛7, ∜19, (16)^2/5 etc. is a surd. In the comparison of surds, we will discuss the comparison of equiradial surds and comparison of non-equiradical surds. In case of equiradical surds (i.e., surds of the same order) n√a and n√b, we have n√a > n√b when x > y. (ii) ∛21 < ∛28, since 21 < 28. (iii) ∜10 > ∜6, since 10 > 6. Clearly, the orders of the given surds are 3 and 4 respectively and LCM Of 3 and 4 is 12. Convert each of the following surds into equiradical surds of the lowest order and then arrange them in ascending order. We see that the orders of the given surds are 3, 4 and 12 respectively. Now we need to find the lowest common multiple of 3, 4 and 12. Therefore, equiradical surds of the lowest order ∛2, ∜3 and 12√4 are 12√16, 12√27and 12√4 respectively.